a dedicated chess computer incorporating a Z80 processor with a Cyrus program by Richard Lang, designed by Intelligent Software. In 1981, their intention after recruiting Lang was in marketing an improved version of Cyrus in a sensory board computer. In January 1982, David Levy and Kevin O’Connell visited the Las Vegas Winter Consumer Electronics Show. There they started talking to some people who distributed chess sets in Paris . Manufactured by a French company around Frederic Ries , the computer was named after the famous 19th century Café de la Régence in Paris, and La Regence went on sale in France in November 1982, a luxury machine with a magnetic sensory board for the French market, priced at 3,900 francs. 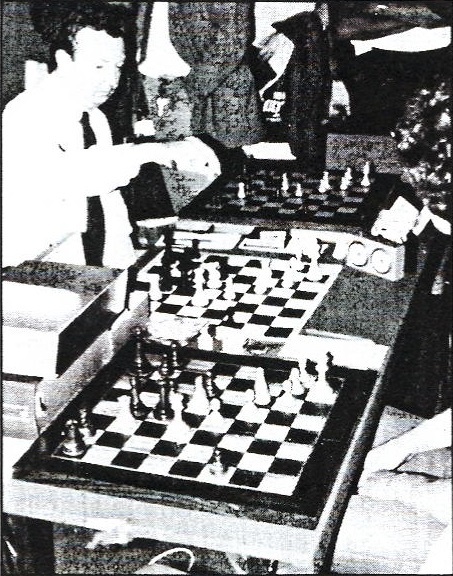 According to Kevin O’Connell, a La Regence program already played the ACM 1981 Blitz tournament still running on an Osborne Z80 based computer, beating Cray Blitz and Chess 4.5, and only losing from Belle . However, the Philidor Software program which played the ACM 1981 main tournament was called Philidor with David Broughton and Mark Taylor mentioned as authors in the booklet  and likely more related to Vega rather than Cyrus. A dedicated La Regence prototype played the European MCC 1982, and became unlucky runner up behind Advance 2.4 after losing in the final round by it's own stablemate Philidor. 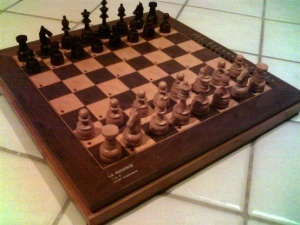 The La Regence was a commercial flop in France - in 1983 Ries' company went into liquidation and some of the remaining stocks could find their way to the Market , distributed by Sandy Electronic, the German company in the dedicated chess computer market otherwise associated with trading Applied Concepts aka Chafitz computers under their own brand. Despite as mentioned elsewhere  , there is probably no other connection of the La Regence with Applied Concepts and Chafitz . This page was last edited on 12 April 2019, at 14:34.